On the hunt for the best dish rack because you've recently had a kitchen revamp or just want a tidy area around the kitchen sink? Whatever the reason, a dish rack or drainer is a must-have. Whether you are looking for one simply to get the job done or a design that fits in with the rest of your kitchen gadgets, we’ve picked out the best dish racks and drainers to make washing up a hassle-free chore. For more kitchen product recommendations, head to our kitchen hub page. What to consider when buying a dish rack or drainer? How much crockery can it hold? Before you buy, though, bear in mind that it's not just about how it looks – you need to think about your kitchen worktops and how much room you have. If you often have lots of washing up, then a double tiered dish rack will save you taking up too much space, or if it's only mugs and glasses you need to drain, sometimes a mat can be less intrusive on your worktops. For those who like to keep their kitchen looking like a showroom, then a fold away dish rack will allow you to pretend the washing up never existed once it’s dried. Fold away ones are also less likely to be susceptible to the build-up of limescale or dirt because they are not left with stagnant water on them after the dishes have been put away, too. This plastic dish rack is completely adjustable so you can shape it to your needs and make the most of the draining space you have. It has an integrated spout which is designed to drain excess water more so than other standard dish rack and it’s incredibly sturdy so you don’t have to worry about loading it up with lots of dishes. Users like that it is easily stored away when not in use, but do think that it is a little pricey for what it is. However, customers love it because it looks smart in their kitchen and stops puddles from taking over their draining board. It may be expensive, but it is unlikely to wear like other plastic drainers do, meaning it’s a worthwhile investment to keep your kitchen tidy. 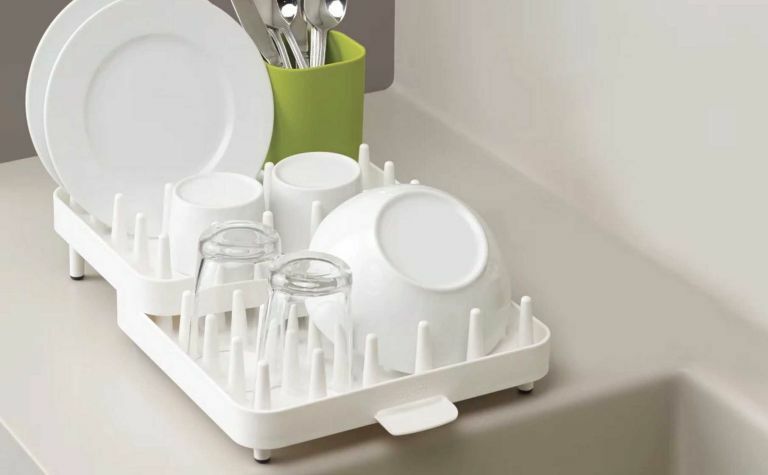 The best dish rack who don’t have a draining board already, as this can sit on the kitchen worktop and it will collect any excess water in its self-contained tray. The only trouble with this is that some users noted it can get dirty quickly when it’s not automatically draining the water, but since it is collapsible, this dish rack is designed to be drained and dried before being stored out of the way. Customers say that it is an extremely flexible tool that can dry all crockery, cutlery and glasses without fear of damage but that it may not be big enough for households of three or more. Small kitchens don’t need anything else taking up space on the worktop, which is why this Simplehuman dish rack is ideal for households of one or two people. Its compact container has handles which make it easy to pick up and move around, and it’s designed to fit in the kitchen sink once the washing up is done, so that all your countertops remain free from clutter. It would be enough to hold a single wash load, but if you’re one to let the washing up pile up, you’re unlikely to fit it all in this drainer. This self-contained tub keeps all of your crockery in one place and allows you to put everything away where it belongs when dry due to its carry handles. It’s a little narrow so it can’t hold pots and pans, but it’s perfect for your everyday bits and bobs. It comes in a range of colours to suit all kitchens and it won’t break the bank. Users have said it can be a little tricky to clean as it doesn’t have a draining spout, but it does fit neatly in your kitchen sink, making it the best dish rack for small kitchens with limited surface space. If you don’t like the idea of a dish rack, or you need something in addition to your dish rack, then this drying mat is the best way to drain your mugs, glasses and bowls. It can easily sit on your worktop next to the sink and is a much better way of keeping your worktop dry than using a tea towel. The only downside is users say the mat itself then gets very wet, meaning it needs to be wrung out occasionally. It is machine washable though, which stops it from gathering mildew or mould and it’ll also protect your worktop from getting chipped or scratched by the crockery.